Moosey the Hopeless has been hunting through rose books, searching on the internet, and scouring all the old hand-written journals. 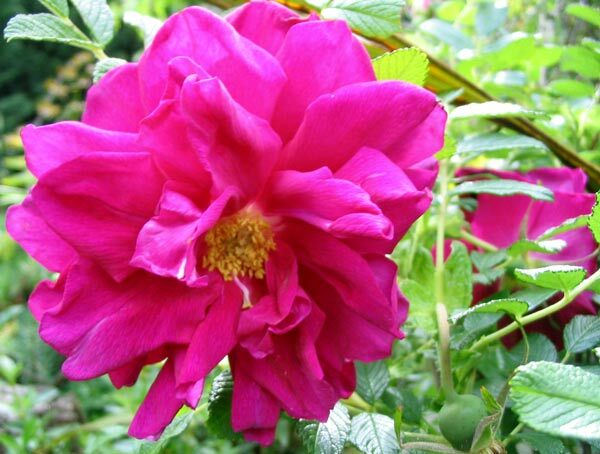 The names of the many rugosa roses in the garden - what are they? Oh, they're well documented in those first diaries. In late 1999, for example, I proudly say: 'The rose border is almost organised - 5 more rugosas are planted.' I have chronicled really useful stuff - the exact day, time of day, the state of the weather, the gardening shirt I was proudly wearing, and the state of the cricket - but not the rose names! Aargh! I know I have two Agnes Rugosa roses - they're fluffy and yellow, but I also have a single yellow. I can't find its name in my books, though. 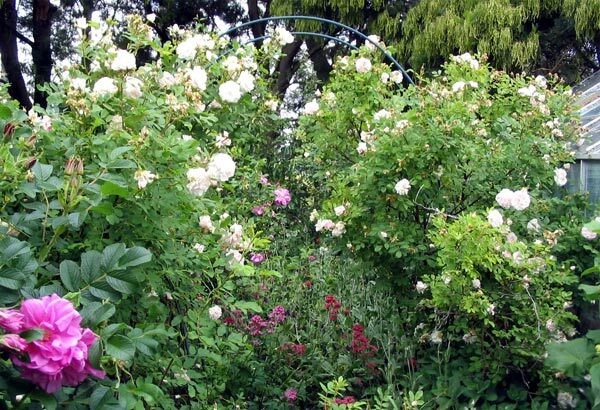 Another puzzle - the roses I think are Roseriae de l'Hay have the right leaves, flowers, and perfume - but they set hips, and my big book of roses specifically states they shouldn't. Can books be wrong? I guess so, but Moosey the Hopeless is much more likely to be. When I first became interested in Rugosas the Moosey garden was very new. I was clearing and digging under the Wattles and behind the glass-house. There was nothing here but paddock, a few old fruit trees, and the irrigation pond. Nobody has the insight to take photographs of nothing - so there are no pictorial records. I was a young gardener with no confidence, not thinking I could write down anything very useful. Well, that's certainly changed! 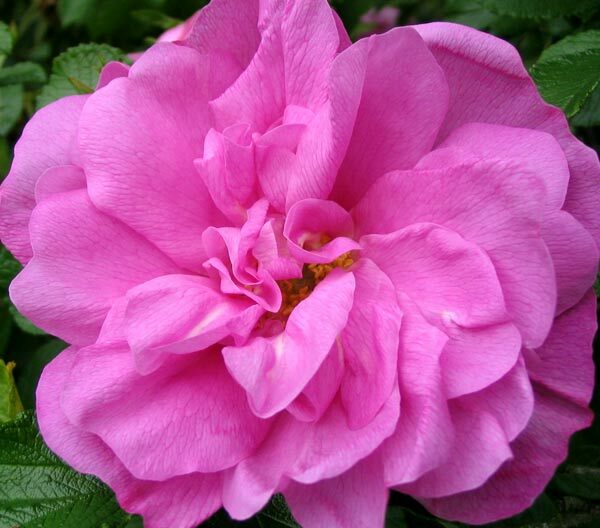 In 1999 I passed myself off as a Rugosa collector, and bought some from a nearby country garden which was in decline. I chose ones I didn't have, and these formed the backbone of the so called Rugosa Garden by the Hen House. I remember nodding wisely when they were named (of course, bona fide Rugosa Rose collectors don't need to write the names down on paper). Unknown Rugosa - Possibly Sir Thomas Lipton? 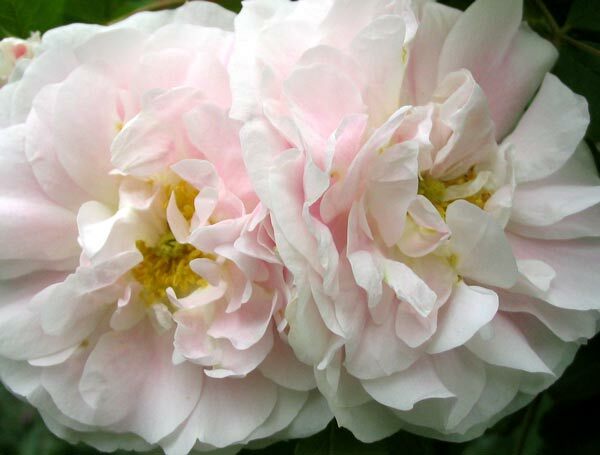 The loveliest of all has fluffy flowers, pink in the middle, white on the edges, and has beautiful yellow leaf colour in autumn. It also suckers, and is tall. I've tried matching it with Conrad Ferdinant Meyer, Martin Frobisher, and Souvenir do Philemon Cochet. Anyone who can name this Rugosa will get Christmas cards from me for eternity! Is it just possible that this rose is Sir Thomas Lipton? I associate this name with cups of tea - and the sea (a famous English yacht). A visitor from Scotsville, VA has made the identification - Sir Thomas Lipton grows in their garden. Thanks heaps to Baylor for writing in. And I've found an old Sir Thomas Lipton rose label in the top kitchen drawer, if further proof is needed!